Daemen College was definitely ready for their students & faculty to flood the campus this September! 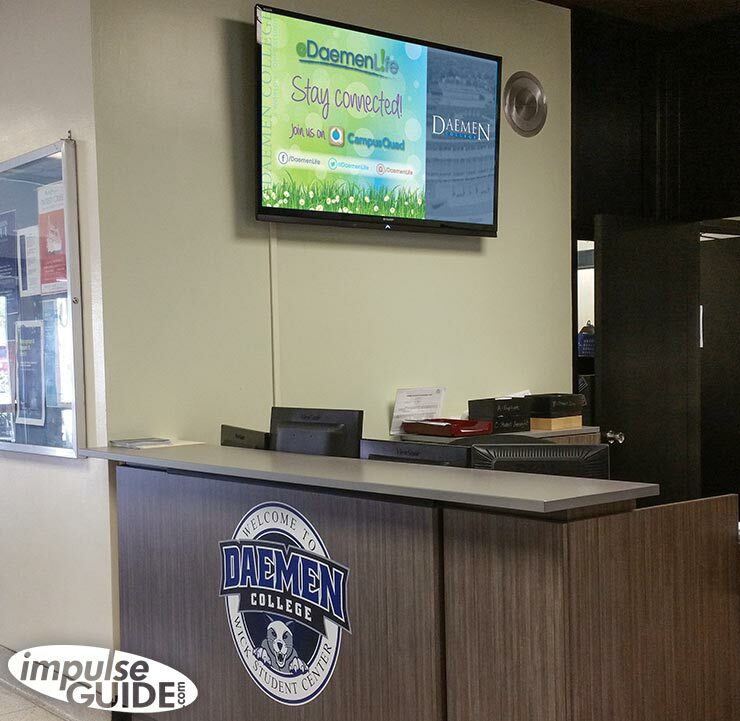 Over summer Daemen College purchased the impulseGUIDE Digital Signage system for their Wick Center & then expanded it to their Athletic Department. They utilized our graphic design services (that are included in their monthly software licensing fee) to get their information up in no time! Not only did it welcome all of the students but it also gives them their itinerary & all of the campus events. Our easy-to-use scheduling tool is beyond perfect for them because they have so many fun things going on around campus. Once an event is over, it is scheduled to stop playing, so there isn’t any excess or old content on the screens. All of the content can be shared throughout the campus, so they can mix and match to suit their needs. The athletic schedules are playing in the Athletic Department as well as on the Wick Center screen, but not all of the Wick Center information is on the Athletic screen because they want that one more focused on sporting events. We are very excited to be working with Daemen College & cannot wait to see all of the great ways they will utilize our system! Many businesses embrace the changing of seasons with sales and menu/product additions. A cost effective way to go about this is by utilizing your digital signs! 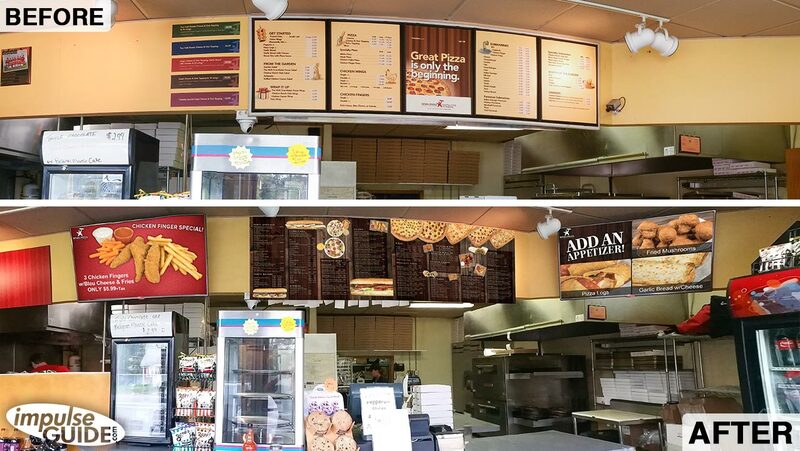 Instead of purchasing a new menu board, or printing out a piece of paper describing your new additions, you can simply change your digital menu boards! It is much more cost effective than constantly printing new materials and it is definitely an environmentally friendly option since you are saving loads of trees! Sales can be stressful – whether it’s a seasonal thing or a weekly thing, they can become hectic very fast. impulseGUIDE’s digital signage system offers extremely easy scheduling tools, so if you already know your changes for the upcoming seasons you can schedule them in advance, so when the time comes you don’t have to lift a finger for your sale change. Sounds wonderful doesn’t it? We are excited to announce our first year at the Facilities Management Expo in Hamburg, NY! Join us Wednesday, October 21, 2015 between 9:30 am – 4:30 pm. Stop by booth 202 to see how our digital signage can work for any business! A-1 Concrete Leveling, Ace Flag Company, Adarmus Ltd./Hydrotex, ADMAR Supply Co. Inc., Advantage Contractor Supply Inc., American Roofing Systems Corp., Ameristeam, Amherst Alarm, Inc., AZ Light, Bath Fitter of Buffalo, BDI-USA, Inc.,Buffalo Energy, Inc., Building Owners & Managers Association (BOMA) Buffalo, C.S. Kimeric, Inc., Casco Security Systems, Inc., CentiMark Corporation, CertaPro Painters of WNY Inc., Chudy Paper Co., Inc., Concrete Innovations Inc., Constellation Energy, Construction Exchange of Buffalo & WNY, Inc., Corr Distributors, Inc., Digital Surveillance Solutions, Drapery Industries, Inc., Duro-Last Roofing, Inc., Dyson Professional, E.M. Cahill Company, Inc., Eco Serve Pest Services, LLC, EverDry Waterproofing, Future Access Inc., GLR Recycling Solutions Inc., Green Genie Environmental Cleaning, Grove Roofing Services, Hamburg Overhead Door, Inc., HDS Industrial Design & Drafting, Inc., Hearts for the Homeless, Hill & Markes, Inc., Hillyard – New York, HJS Supply Company, LLC, Hooper Handling, Inc., Indoor Air Professionals, Inc., Institute for Supply Mgmt. (ISM)-Buffalo, Inc., Integrity Pest Services Inc., Isaac HVAC, iSIGNS, Jackson Welding & Gas Products, Janitronics Facility Services, JMR Industrial Inc., Johnson Controls Inc., Johnstone Supply of Buffalo, Lehigh Construction Group, Inc./Lehigh Pro Div., Lime Energy, McCullagh Coffee, MidCity Office Furniture, National Overhead Door Inc., Osterman Associates, Inc., Painters Plus Home Decorating Inc., Parise Mechanical Inc., Philipps Bros. Supply Inc., PPG Architectural Coatings, Pro Squared Facility Solutions, Progressive Environmental LLC, Q Ware CMMS (formerly Que Centre), Regional Distributors Inc., Renewal by Andersen of WNY, RIBCO, Inc., Roto-Rooter Services Co., SealMaster, ServiceMaster Clean Building Maintenance Professionals, ServiceMaster Restore of WNY, Servpro of the Southtowns, Sherwin-Williams, Skyworks Equipment Rental, Solar by CIR, Stohl Group of Companies, Suburban Pest Control, Inc., Suburban Property Maintenance, Inc., Synacom Networks Inc., The MJA Company, Thomann Asphalt Paving Corp., Triad Recycling & Energy Corp., United Thermal Systems, Verizon Small Business, W.B. Mason Company, Inc., Water Wise of America, Inc., West Fire Systems, Inc.
See the flyer for more details & registration. Hope to see you there!! 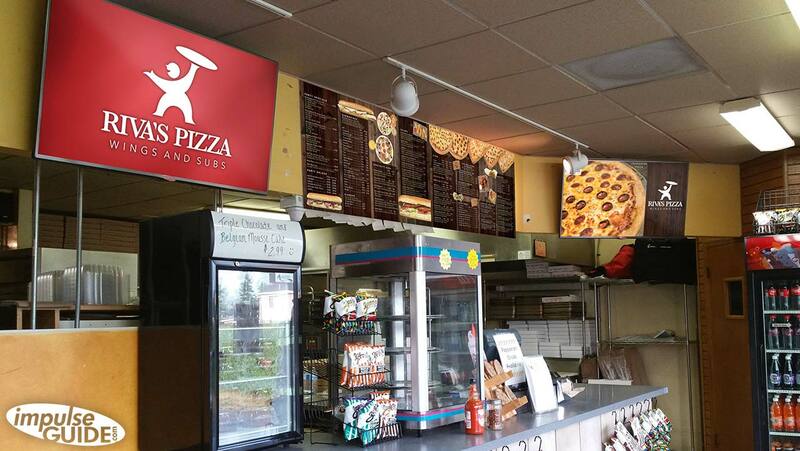 Riva’s Pizza in Depew, NY is the proud owner of a two screen impulseMENUBOARD along with matching coroplast menu boards & our premium take-out menus! We couldn’t be happier to work with such a lovely local business! Thanks, Riva’s, for wanting a new look & choosing us to help you! Riva’s Pizza is located at 3488 Walden Avenue, Depew, NY 14043. John & Mary’s is a Buffalo tradition for Pizza, Subs, & Wings. They wanted to show off their entrees as big beautiful images so that their customers will be enticed to try new menu items; as well as some classics they might have forgotten about. impulseGUIDE outfitted them with two impulseBOARDs, five coroplast menu boards, and a six-page 8.5″ x11″ take-out menu! John & Mary’s branding all matches and is efficiently updated. They can now change their daily specials on their impulseBOARDs from the comfort of any internet enabled computer via the user-friendly impulseGUIDE software. They also utilize our design services included in their monthly subscription to keep their impulseBOARD up to date and their customers enticed! Visit us online at impulseGUIDE.com for more information!! ImpulseGUIDE.com (Getzville, NY) is announcing its DS impulseGUIDE system, which has been designed specifically to meet the supply and end-user needs of static-sign and digital-graphics providers. The system combines content-management software with a media player. The company says its innovations can reduce the effort related to content creation by up to two thirds. The system can be connected to any flat-panel display device and is particularly well-suited to use for digital menu and promotion boards in food services, retail and consumer services applications, the company reports.